You may buy tickets and make entries online. Just go to our home page or any page that has these icons in the left column, click the “Buy Tickets Now” or “Online Entry” icon. Do your entries or purchase tickets for fair admission and Main Arena events from the convenience of your home. No need to worry about the postal service or having to make a trip to the Fair Office when the deadline nears. Site will allow you to add to your entry until August 1st! The entry descriptions listed in the book and on our website are complete descriptions whereas the MarTech© on-line book is abbreviated due to space restrictions. 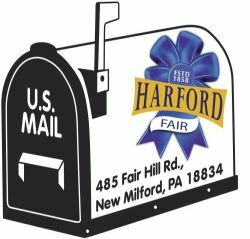 If you need to be sure about the entry you wish to enter, it may serve you well to check out the book or on the www.harfordfair.com website. The address used to set up your account will be used for any correspondence to your entries. i.e. if requested-tags mailed and premium checks issued. You may wish to use the entry form in the book or print out the entry form from our website and use it as a worksheet before doing your final entry on the Online Entries Site. Either way, just relax in the comfort of your home with a cup of coffee and become a part of the fun and competition of the 160th Harford Fair. For more information, please call 570-434-4300.